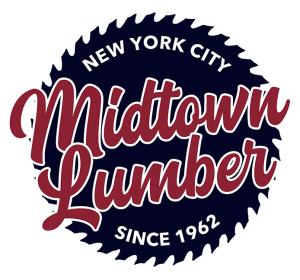 At Midtown Lumber we stock boards ranging from ½” thick to 1 1/16”. However, there are times when a standard thickness isn’t what you’re looking for, so at Midtown Lumber we offer a planing service. Our table top planer allows us to reduce the thickness of the lumber in increments down to 1/32 inch. It can also be utilized for refurbishing older pieces as well. Rather than sanding the marred surface, just run the piece through the planer, with the blade depth set to your deepest scratch or gouge, and you’ll have a factory finished piece of wood ready for staining, painting, varnishing, or any other desired finish. We are happy to use our planing service on any piece of wood purchased in our store, but we are capable of planing your own boards as well. It is important to note the limitations of the machine and our service. We can only plane lumber. Metal and plastic require other type of machinery. The plank must be straight and free of severe warping in order to produce a flat, even surface. The lumber needs to be free of screws, staples, nails or any other foreign objects. If a factory finished, custom thickness piece of material is what you are after, Reach Out and ask about our planing service today!